A well presented detached house situated in this cul de sac location within the popular village of Metheringham. The property benefits from UPVC double glazing and gas central heating. The Internal accommodation comprises of Entrance Hallway, Sitting Room/Dining Room, Kitchen, Lounge Diner, Bathroom and First Floor Landing leading to Three Bedrooms and WC. Outside there are gardens to the front and rear and a driveway providing off road parking and giving access to the car port and detached garage. Viewing of the property is highly recommended. LOCATION Metheringham is a popular village located approximately 10 miles from the historic Cathedral and University City of Lincoln. The village offers a range of local amenities to include the Co-op and Nisa Food Stores, public houses, a church, a vet, food outlets including an Indian restaurant, a fish and chip restaurant and various other takeaways. There is a public outside swimming pool located at the local primary school. There are two day nurseries and Metheringham primary school. The village itself has good transport links, including a train station on the Lincoln to Sleaford line and a bus route. ENTRANCE HALL With UPVC double glazed external door to the front elevation, laminate flooring, radiator, stairs to the first floor and doors to the sitting room/dining room, kitchen, lounge and bathroom. SITTING ROOM / DINING ROOM 9′ 4" x 8′ 8" (2.84m x 2.64m) , with UPVC double glazed window to the front elevation and radiator. KITCHEN 12′ 5" x 9′ 4" (3.78m x 2.84m) , with UPVC double glazed window to the rear elevation, fitted with a range of wall, base units and drawers with work surfaces over and complementary tiled splashbacks, stainless steel sink unit and drainer with mixer tap, integral oven, four ring ceramic hob with extractor fan over, space for fridge freezer, plumbing and spaces for washing machine and dishwasher, breakfast bar with base unit to the side and complementary tiled splashbacks and UPVC double glazed external door to the side elevation. LOUNGE / DINER 20′ 8" x 10′ 4" (6.3m x 3.15m) , with UPVC double glazed windows to the front and rear elevations, brick fireplace, wall lighting and two radiators. BATHROOM 7′ 4" x 5′ 8" (2.24m x 1.73m) , with UPVC double glazed window to the rear elevation, suite to comprise of low level WC, wash hand basin and bath with mains shower over, partly tiled walls and radiator. FIRST FLOOR LANDING With access to the roof void and doors to three bedrooms and WC. BEDROOM 1 13′ 1" x 9′ 4" (3.99m x 2.84m) , with UPVC double glazed window to the rear elevation, radiator and access to eaves storage/wardrobe. 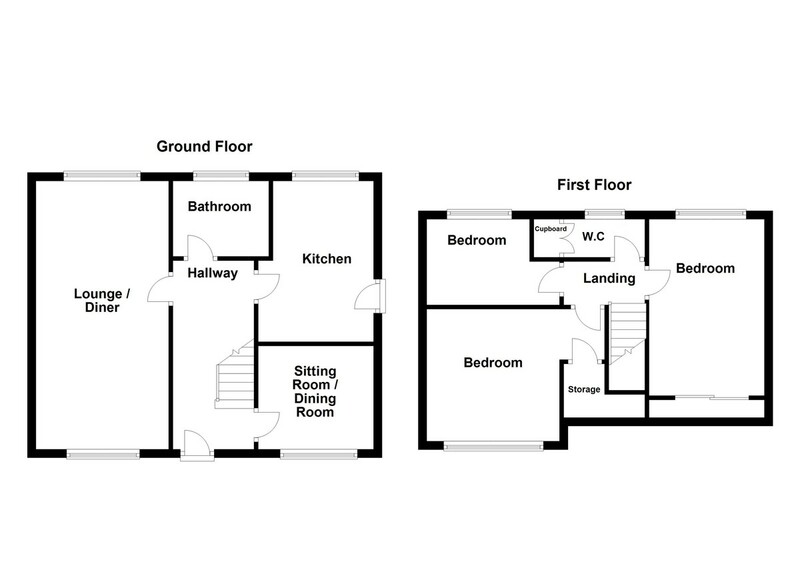 BEDROOM 2 13′ 5" maximum x 9′ 8" (4.09m x 2.95m) , with UPVC double glazed window to the front elevation, radiator and access to eaves storage/wardrobe. BEDROOM 3 10′ 2" maximum x 6′ 8" (3.1m x 2.03m) , with UPVC double glazed window to the rear elevation and radiator. W.C With UPVC double glazed window to the rear elevation, low level WC, wash hand basin with tiled splashbacks, radiator and airing cupboard housing the wall mounted gas fired central heating boiler. OUTSIDE To the front of the property there is a lawned garden with a range of plants, shrubs and trees and a driveway to the side providing off road parking and access to the car port an detached garage. To the rear of the property there is a hardstanding area with lawned garden, flowerbeds surround and a wide range of plants, shrubs and trees. With up and over door, power, lighting, two UPVC double glazed windows and door into the garden.